It ia a condition of Recurring pain on outside of the upper forearm below bend of elbow; usually, pain radiates down the arm towards the wrist.Pain initiate during grasping even light objects such as a coffee cup, lifting and bending the arm.Due to inflammation of muscles, tendons and ligaments, pain extend to the forearm.Pain usually lasts for 6 to 25 weeks; but discomfort can be there for a period of 3 weeks or as long as many years. Laborers : Greater risk of developing Tennis elbow is in the person who work with their hands. It includes Jobs of plumbers, painters, gardeneres, carpenters, etc. 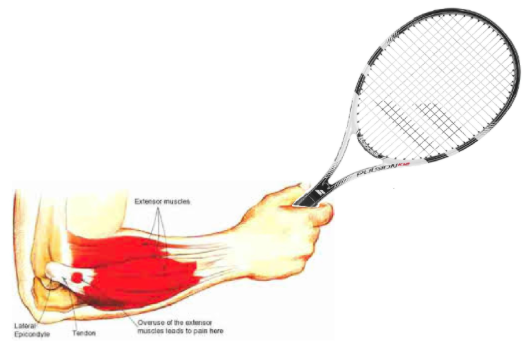 Sports participants : Especially who play with racquet suffers with tennis elbow. About 1/3rd of regular players experience it at some point in their sports careers. In addition to racquet sports players, tennis elbow is found in golfers, fencers and other sports players. Allopathic medicines such as NSAID- non steroidal anti-inflamatory drugs areusually given, but when pain is not controlled with it, steroid injections are used, that too with tempearory relief at the end surgery is advised. Relaxing of nearby muscles can take pressure off an aching elbow. Gently massage the full forearm muscle from your elbow to wrist. Rubbing the ice cube on your elbow in a circular motion for 4 to 6 minutes. Repeat this at least 3 times a day. Do some strengthening and stretching exercises to rehabilitate the elbow joint and protect it from injury again. Use elbow support as that prevents from contracting the extensor muscle when moving your hand.